Update 2016-03-05: Poster, flyer, registration form, and a way to pay online! A fun event for good causes. 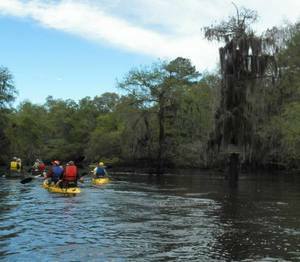 This four mile downstream paddle on flatwater takes you on a winding course through pretty south Georgia forest, under towering cypress trees, past live oaks, coppices of ogeechee tupelo, and majestic pines. The tannin stained blackwaters reflect the beautiful scenery and are typical of the coastal plain. Paddle it to win or just to enjoy. Cash prize to the paddler who finishes first. Medals to top finishers in several categories: male and female solo canoe, male and female solo kayak; male 2 person canoe, female 2 person canoe, mixed 2 person canoe, male tandem kayak, female tandem kayak, mixed tandem kayak. Entrance fee includes a free lunch at the end of the race. Fastest paddlers will complete in under an hour; slow paddlers in 1.5-2 hours. Bring your own boat or rent one from Reed Bingham State Park (advance reservations recommended). There will be a registration fee, well worth it for the fun, community, and to support your friendly local watershed organization; details to come. Here are last year’s winners. Meanwhile, these other events coming up sooner are free, although we recommend you support WWALS by becoming a WWALS member. See you at the paddle race, or at one of the other outings or events. And you may want to help build the Withlacoochee and Little River Water Trail. This entry was posted in Blueway, Outing, River and tagged BLRPR16, Blueway, Bret Wagenhorst, conservation, FORB, Friends of Reed Bingham, Friends of Reed Bingham State Park, Little River, Outing, paddle, race, Reed Bingham State Park, river, south Georgia, Withlacoochee and Little River Water Trail, WWALS, WWALS and FORB, WWALS Watershed Coalition on January 23, 2016 by jsq.